Yes, you read the title right. This is a Bacon Chocolate Banana Cream Pie with a Bacon Crust if you feel so inclined. You can thank the culinary genius behind Elana's Pantry for the inspiration for this recipe. You see, that woman is nothing short of amazing with all that she does and we have become quite the Twitter BFF's lately. Hopefully she doesn't think that I am a creeper given my fan boy status online. You ask why she is amazing? Well she has hammered out some gorgeous cookbooks already loaded with gluten free recipes and this time she has tackled Paleo. So when I received my copy in the mail, I was excited to get through it. Before I started reading I was scrolling through her site and was too inspired with her banana cream pie recipe that I had to make that and talk about the book later. So with that, you get my version using bacon fat in the crust instead of coconut oil and my filling version with bacon, chocolate, and coconut. WINNING! So her gorgeous new cookbook, Paleo Cooking from Elana's Pantry is a necessary tool in your Paleo Kitchen. It is honestly a scientific mystery to me how Elana keeps her recipes so simple yet packed with flavor. Her beautiful recipes and eloquent style will transform you into the life of any party you contribute food too. People will think you slaved for hours and you can smile knowing that Elana did all of the guess work and trials for you. The true mark of a genius is making things look easy, and she is so good she even makes them easy for you. Go grab her book now by clicking on the photo below. It starts shipping June 18th. In case you were wondering what was on the inside of her book, you get 100 new Paleo recipes that consist of entrees, vegetable dishes, condiments and healthy desserts. All of the recipes are gluten-free, grain-free, dairy-free, and nightshade free. She also included an abundance of nut-free and egg-free recipes to cater this book to everyone. You can have a peek inside on amazon by clicking on the book photo here. If I keep gum bumping I run the risk of boring you so I will end it here. Two things I need from you, go order her book now and then go make this recipe and try not to eat it all yourself. Good luck. If you are in a rush, you can make this recipe by combining all the ingredients in a high speed blender and blending at once. Then pour your filling over your pie crust. I prefer the airiness of whipping the coconut milk first. Definitely something different. I added chocolate chips, coconut, and more honey to my liking. I’ve been wanting to make this for awhile, and finally did! I really liked this recipe! I used cashew cream instead of the coconut and palm oil instead of the coconut oil (intolerant to coconuts). I felt like the crust would have been better if it were sweetened, but overall I was happy with the results. I especially loved that hint of bacon goodness! The fam loved it too! I love all your recipes and your website! Two questions for the pie. 1. Can you substitute something like grass fed butter for the coconut oil? 2. Can you leave the cocoa powder out? Hello :) yes, you can substitute the coconut oil, but I’m not sure about the cocoa powder. How about you try it out and get back to me? What do you think about using tallow in the place of bacon fat? I’m making this for my mom’s birthday on Monday and have a lot of tallow that I rendered. Thoughts? Did anyone find the amount of bacon fat overwhelming? Is there any suggested substitue for the 1/2 cup of bacon far in the filling? We made this and felt like we were eating nothing but a big bowl of chocolate bacon fat. TIA! Just so you know, you can make a pretty amazing chocolate tart by simply putting the crust in a tart pan and removing the whipped coconut cream from the filling. The filling ends up as this creamy ganache. I even took out the honey, and it still had plenty of sweetness. How can I love you and hate you all at the same time? I am itching to make this RIGHT NOW. BUUUUTTT… I am currently in the middle of a Whole30 challenge at our CrossFit box and we can’t have any sort of Paleo “treat” whatsoever! This WILL be made for our post-Whole30 celebratory dinner! I can’t wait! Hey George! On Elana’s site, she says you need to use the Ronco Bass-o-matic (aka the Vitamix) or it won’t work. Will my regular Kitchen Aid blender work or is it better in the food processor? 1) Could I substitute grass fed cream for the coconut milk cream? 2) Do you think you could do a blend of coconut and almond flour for the crust? Trying to limit our almond intake. Thanks! Great work, as always! Worked great with a cup of almond flour and a cup of coconut flour. AND TASTED AMAZING. Oh that is great to know, you did half and half in the crust? I love this- LOL! I topped my husband’s non-Paleo triple chocolate cake with chocolate covered bacon. I wasn’t about to leave that out! Does anyone have an equivalent substitute idea for almond flour that is equally good in all categories? I have anaphylactic reactions to nuts — any I have tried that is! — and almond flour will not be a great idea for me! Sometimes I find that using equal parts coconut flour and golden flax seed meal work well in some recipes. Make sure the flax seed meal is ground fine, I have to process the kind I buy a little more or it is “grainy” in the recipes. OMG was said in tandem by my husband and myself when we saw this last night. I can’t wait to make it, I’m not much of a baker having only really starting to enjoy baking after going paleo last June. Keep the recipe’s coming George, what you are doing for the Paleo community is awesome! Thank you Colleen, let me know how you like it. OMG. This looks amazing! 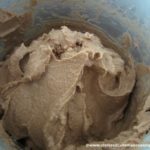 How do I blanch almond flour? Or do I have to buy it already blanched? Thanks! I actually just came to your site hoping to find this recipe after seeing it on Instagram the other day. And it got posted today! I will be making this for my husbands Father’s Day dessert tomorrow! Thank you!